This article is about the combined FIFA world football player award issued between 2010 and 2015. For the European football award given by France Football, see Ballon d'Or. For the previous FIFA award (1991–2009), see FIFA World Player of the Year. For the current FIFA award (since 2016), see The Best FIFA Men's Player. 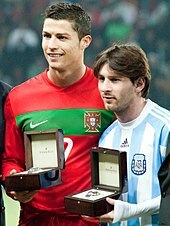 Lionel Messi (right), pictured here with Cristiano Ronaldo in 2011, dominated the award with 4 wins, 2 of which won consecutively. The FIFA Ballon d'Or (French pronunciation: ​[balɔ̃ dɔʁ], "Golden Ball") was an annual association football award presented to the world's best men's player from 2010 to 2015. Awarded jointly by FIFA and France Football, the prize was a merger of the FIFA World Player of the Year award and the Ballon d'Or, the two most prestigious individual honours in world football. The FIFA Ballon d'Or was awarded based on votes from international journalists and national team coaches and captains, who selected the players they deemed to have performed the best in the previous calendar year. The six editions of the FIFA Ballon d'Or were dominated by Lionel Messi and Cristiano Ronaldo, as part of their ongoing rivalry. Barcelona's Messi won the inaugural Ballon d'Or in 2010 and went on to win three in a row, after his wins in 2011 and 2012. Ronaldo, who plays for Juventus, won successive awards in the next two years. The final FIFA Ballon d'Or was presented to Messi in 2015. Its awarding bodies subsequently ended their partnership; for 2016, France Football reintroduced the previous format of the Ballon d'Or, while FIFA created The Best FIFA Men's Player award. 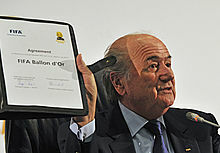 FIFA President Sepp Blatter holds up the agreement creating the FIFA Ballon d'Or in Johannesburg in July 2010. Historically, the leading individual awards in association football were the Ballon d'Or and the FIFA World Player of the Year award. The original Ballon d'Or, also known as the European Footballer of the Year award, had been awarded by the French publication France Football since 1956. The FIFA World Player of the Year award was presented by FIFA, the sport's governing body, from 1991. From 2005, the winners of the Ballon d'Or and FIFA World Player of the Year award were identical each year. Following the introduction of a global Ballon d'Or format in 2007, France Football and FIFA opted to merge the two awards. The creation of the FIFA Ballon d'Or was subsequently announced during the 2010 FIFA World Cup in South Africa. The inaugural award was presented that same year to the Argentine Lionel Messi. After a six-year partnership, France Football and FIFA terminated the joint award. Lionel Messi had received the final FIFA Ballon d'Or. For historical purposes, both awarding bodies regard the six editions of the FIFA Ballon d'Or as a continuation of their respective awards. The winners of the FIFA Ballon d'Or were chosen by international journalists and the coaches and captains of the national teams under FIFA's jurisdiction. In a system based on positional voting, each voter was allotted three votes, worth five points, three points and one point, and the three finalists were ordered based on total number of points. Voters were provided with a shortlist of 23 players from which they could select the three players they deemed to have performed the best in the previous calendar year. In 2013 Pelé was given an honorary Ballon d'Or, having won three FIFA World Cups with Brazil but never an individual award from FIFA, as during his playing career only European-based players were eligible to win the original Ballon d'Or. ^ FIFA and France Football credit Messi, the recipient of the 2009 Ballon d'Or and FIFA World Player of the Year award, with five Ballons d'Or in total (2009–12, 2015). Messi additionally placed as a finalist for both awards in 2007 and 2008. ^ FIFA and France Football credit Ronaldo, the recipient of the 2008 Ballon d'Or and FIFA World Player of the Year award, with five Ballons d'Or in total (2008, 2013–14, 2016–17). Ronaldo additionally placed as a finalist for both awards in 2007 and 2009. ^ Xavi additionally placed in third place for the 2009 Ballon d'Or and FIFA World Player of the Year award. ^ "World Cup 2010: Fifa and Ballon d'Or player awards to be merged". The Daily Telegraph. 5 July 2010. Retrieved 15 January 2016. ^ Wahl, Grant (15 September 2010). "Xavi, Messi are primary contenders for the 2010 FIFA Ballon d'Or". Sports Illustrated. Retrieved 15 January 2016. ^ a b c "The FIFA Ballon d'Or is born". FIFA. 5 July 2010. Retrieved 15 January 2016. ^ "Argentina's Lionel Messi wins Fifa Ballon d'Or award". BBC Sport. 10 January 2011. Retrieved 15 January 2016. ^ "Ballon d'Or: FIFA ends association with world player of the year award". BBC Sport. 16 September 2016. Retrieved 12 October 2016. ^ a b c "FIFA Ballon d'Or: History". FIFA. Retrieved 15 January 2016. ^ a b c "Ballon d'Or Palmarès: La liste complête des lauréats du Ballon d'or, de 1956 à nos jours" [Ballon d'Or Winners: The full list of the winners of the Ballon d'Or, from 1956 to our days]. France Football. Retrieved 15 January 2016. ^ "Rules of allocation" (pdf). FIFA. Retrieved 15 January 2016. ^ a b c Pierrend, José Luis (12 February 2015). "FIFA Awards: World Player of the Year". Rec.Sport.Soccer Statistics Foundation. Retrieved 15 January 2016. ^ a b c Moore, Rob; Stokkermans, Karel (21 January 2011). "European Footballer of the Year ("Ballon d'Or")". Rec.Sport.Soccer Statistics Foundation. Retrieved 15 January 2016. ^ "Pele receives FIFA Ballon d'Or Prix d'Honneur". FIFA. 13 January 2014.